General Manager (HR & Admin), Lahore Waste Management Company, 4th Floor, Shaheen Complex, Egerton Road, Lahore. 2. Preferably first class academic career, however, one-second division may be allowed except in final degree. 3. A first-class degree means a minimum of 60% marks for the annual system or CGPA 2.5 out of 4.0 for semester system and second class means a minimum of 50% marks for the annual system or CGPA 2.0 out of 4.0 for the semester system. 4. Upper age limit is 35 years. However, relaxation in age may be given as per rules. 5. Candidates must have obtained educational degrees from the institutions / universities duly recognized by Higher Education Commission and registered with Pakistan Engineering Council (for Engg. Degree) and Pakistan Medical and Dental Council (for Medical Degree). Officers Sr. # 1 (i), are likely to be placed in Faisalabad / Gujranwala / Karachi, Sr. # 1(ill) in Chashma (Mianwali) and Sr. # 1(ii) & Jr. 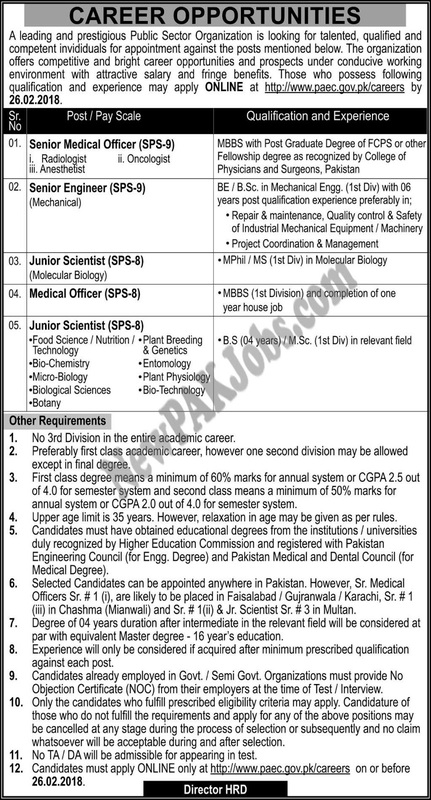 Scientist Sr. # 3 in Multan. 7. The degree of 04 years duration after intermediate in the relevant field will be considered at par with an equivalent Master degree - 16 year’s education. 8. Experience will only be considered if acquired after minimum prescribed qualification against each post. Objection Certificate (NOC) from their employers at the time of Test/ Interview. 10. Only the candidates who fulfill prescribed eligibility criteria may apply. Candidature of those who do not fulfill the requirements and apply for any of the above positions may be canceled at any stage during the process of selection or subsequently and no claim whatsoever will be acceptable during and after selection. 11. No TA/ DA will be admissible for appearing in the test.